Lansing, Mich. – The Michigan Economic Development Corporation and the City of Southfield today announced a new crowdfunding campaign through Michigan-based crowdfunding platform Patronicity. The campaign will create an interactive art installation along the new Northwestern Highway Pathway in Southfield’s City Centre. Funding raised during this campaign will support the creation of Red Pole Park as a destination that will exemplify Southfield’s redevelopment as connected and pedestrian friendly community. This redevelopment began with converting an old goat path into a brand new bike-walk accessible greenway to join a growing network of trails and new sidewalks throughout Southfield. 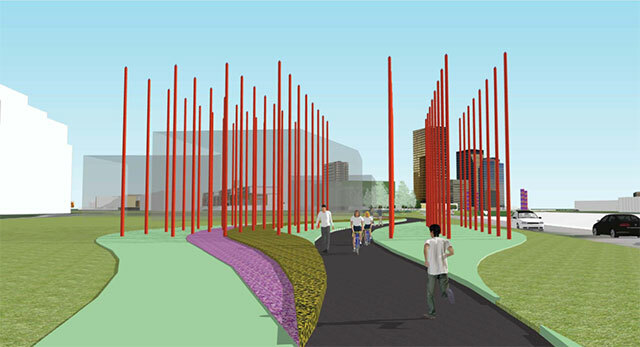 The greenway will include a series of outdoor “rooms” or art installations that residents and visitors will experience when using the path, of which Red Pole Park will be the first. Public Spaces Community Places is a collaborative effort of the MEDC, MSHDA, the Michigan Municipal League, and Patronicity where local residents can use crowdfunding to be part of the development of strategic projects in their communities and be backed with a matching grant from MEDC. Communities, non-profits and other business entities can apply at https://patronicity.com/puremichigan. For more on the MEDC and its initiatives, visit michiganbusiness.org. For Michigan travel news, updates and information, visit michigan.org. Michigan residents interested in seeking employment with any of Michigan’s growing companies should check mitalent.org, where more than 93,000 jobs are currently available in a variety of industries.